The microirrigation systems market was valued at USD 2.53 Billion in 2015; this market is projected to grow at a CAGR of 18.3% from 2016 to 2021, to reach 6.81 Billion by 2021. The microirrigation systems market has been segmented on the basis of on the basis of crop type and mode of application. It has been further segmented on the basis of region into North America, Europe, Asia Pacific, and the Rest of the World (RoW). The main objectives of the report are to define, segment, and project the market size of the microirrigation systems with respect to the above-mentioned segmentations and provide a detailed study of key factors influencing the growth of the market, along with profiling the key players in the market and their core competencies. This report includes estimations of market sizes for value (USD million) with the base year as 2016 and forecast period from 2017 to 2022. Top-down and bottom-up approaches have been used to estimate and validate the size of the microirrigation systems market and to estimate the size of various other dependent submarkets. All percentage shares, splits, and breakdowns have been determined using secondary sources such as the International Commission on Irrigation and Drainage (ICID) and Food and Agricultural Organization (FAO), and were verified through primary sources. 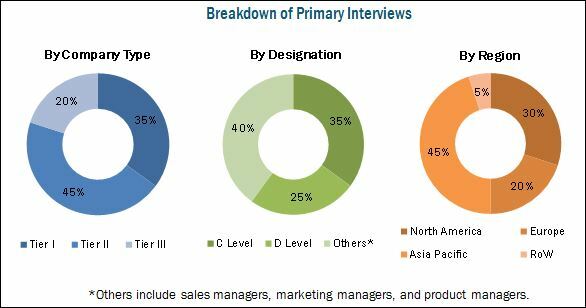 Key players in the market have been identified through secondary sources, and their market share in respective regions has been determined through primary and secondary research. The market ecosystem includes raw material suppliers, microirrigation systems manufacturers, distributors and end users. The key players that are profiled in this report include The Toro Company (US), Jain Irrigation (India), Rain Bird Corporation (US), Netafim (Israel), Valmont Industries (US), Hunter Industries (US), and Lindsay Corporation (US). Depending upon the application, the global market is led by orchard crops & vineyards, followed by plantation crops. Rapid growth in the production of greenhouse vegetables is driving the application of microirrigation systems in orchard crops. Higher yield requirement from limited areas has also led to the growth in its application. Amongst the types of microirrigation systems such as drip and microsprinkler, drip irrigation systems accounted for the largest market share in 2015. Drip irrigation is widely used because, with its application, nutrient loss is reduced, leaching is minimized, growth of weed is reduced, soil erosion is checked and cost of energy is also reduced since it operates in lower pressure. Among the end users such as farmers, corporates and others, corporates accounted for the highest share in 2015, whereas the farmer end user segment is growing with a highest CAGR due to the increased awareness of the advantages of microirrigation for agricultural use. 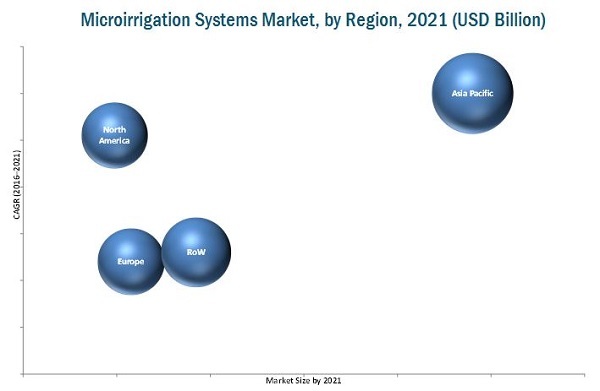 North America accounted for the largest market share for microirrigation systems, Mexico being the fastest growing in the region, from 2016 to 2021. On the other hand, Asia-Pacific is projected to be the fastest-growing market for the period considered for this study, due to the growing demand for water and increasing water scarcity. High investment required at the time of installation of microirrigation systems is one of the restraints for the global market. The continuous maintenance requirement is further hindering the growth of the microirrigation systems market. Jain Irrigations Systems Limited, one of the prominent players in the microirrigation systems market, focuses on both drip irrigation and microsprinkler systems. The company’s core competencies are advanced manufacturing and quality-control systems, regulatory expertise, market knowledge, and R&D capabilities. Recently, the company signed an agreement with Tata Trust (India). The agreement encompasses working towards improvement of agribusiness and research, extension of agriculture and development structures in India.